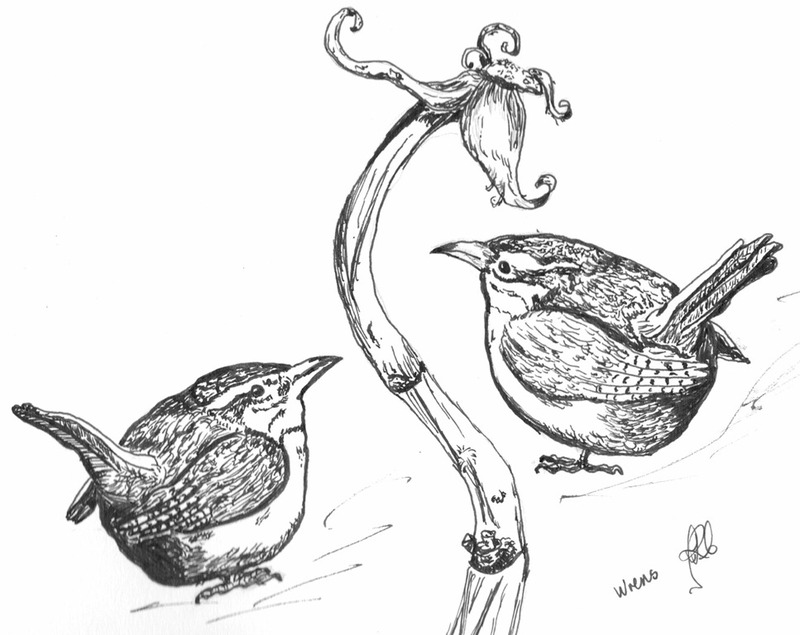 Pre-living in France I used to see the occasional wren if I was lucky. I bought into the general conception of tiny, shy, delicate bird, hard to observe and to spot. Here there is time and opportunity to see that wrens are tiny but make a noise like a machine gun when they are being feisty, which seems to be most of the time, and far from being shy threaten anybody and anything if they are disturbed. Sweet, yes, innocent and retiring…….umm. Our woodpile is their favourite place at the moment so I can watch them from the comfort of the stump in the side doorway whilst being just far enough away that they ignore me. They really don’t like me taking any of their wood but as I need it with the weather being a bit schizophrenic at the moment I get a burst of gunfire, indignant wing flapping and you can tell they should really wash their beaks out with soap as that is unmistakably language well brought up birds wouldn’t know let alone use. The Hound of the Basset Lady.